For a firsthand look at one of the country’s most beautiful public buildings, look no further than the Santa Barbara County Courthouse. 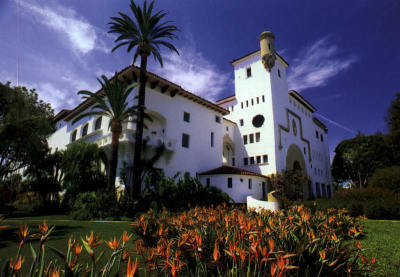 Designed in the Spanish-Colonial style and completed in 1929, the still-functioning Courthouse is an iconic Santa Barbara landmark with its distinctive four-faced clock tower, red tile roof, elegant arches and verdant sunken garden and grounds. Inside, you can get a visual history lesson from the elaborate hand-painted murals, marvel at ornate wrought-iron chandeliers and climb to the top of the clock tower for a panoramic view of Santa Barbara and beyond. The Santa Barbara County Courthouse is open daily, including free drop-in tours hosted by the Santa Barbara County Courthouse Docent Council. On the tour, docents provide an overview of the building’s architecture, share entertaining stories from its history and point out the most fascinating details. Visit Monday through Friday, 8 p.m. to 5 p.m., and weekends 10 a.m. to 5 p.m. Tours start in the Mural Room on the second floor every day at 2 p.m., and also at 10:30 a.m. on weekdays. During Old Spanish Days Fiesta in August, tours of the Courthouse happen even more frequently as part of the festivities: every half hour Wednesday through Saturday, and every hour on Sunday, 10 a.m. to 3 p.m. The Courthouse is located in downtown Santa Barbara, close to shopping, dining and other interesting cultural attractions. You can take the handy Downtown Shuttle up and down nearby State Street for just 50 cents, and there’s a parking lot across from the Courthouse on Anacapa Street where the first 75 minutes are free. The Clock Tower closes a bit earlier than the rest of the complex at around 4:45 p.m., so be sure to plan for enough time to see it—the 360°-degree view of Santa Barbara is a can’t-miss. The top of the Tower is accessible by both stairs and elevator. Bring along a picnic to enjoy beneath the palms in the lovely and meticulously maintained sunken garden. If possible, plan to stop by when you can get a literal inside look at the Clock Tower in the Bisno Schall Clock Gallery. Climb the tower stairs to see the mechanism of the huge clock, installed in 1929 and is still ticking. Surrounding the clock is an impressive 60-foot mural depicting the history of timekeeping. To ensure the gallery is open during your visit, please check current hours here. As you tour the various rooms of the Courthouse, don’t forget to look up! Gorgeous details are everywhere, including the ceiling in the Mural Room, which is just as intricately painted as the walls. In the Clock Gallery, the ceiling is decorated with the exact constellations from the night sky when Santa Barbara was named in 1602, complete with sparkling fiber optics. Looking to fill out your Santa Barbara trip? Both of these itineraries include Santa Barbara County Courthouse.